Within the next 10 years, I want young women worldwide to be spared the pain and indignity of medieval braces and the horrors of scoliosis surgery. – Dennis Woggon. D.C.
Dr. Dennis Woggon is the founder of CLEAR Institute, a nonprofit organization with a goal of providing the chiropractic and medical communities with an effective system of chiropractic scoliosis care without the use of archaic braces or invasive surgery. KOCH: The last time we spoke was when you visited me here in the Bahamas. This interview is a good excuse for me to catch up on what you’ve been doing. Before we talk about your work, I think it would be good to tell our readers how you got into chiropractic, because your story explains a lot about the depth of your dedication and what motivates you. In 1953, my Father had a sore throat that had lasted for 2 years. The drugs the MD gave him helped temporarily but it always returned. He then saw a DC, and after 4 adjustments, it was gone. When I was 8 years old, I suffered from severe insomnia. Many days and weeks went by that I simply could not sleep. After the first adjustment, I fell asleep in the car on the ride home. When I was 12 years old, I was swinging on a rope and hit a tree. It seemed like I had injured my shoulder, causing severe pain. An MD examined me and said nothing was wrong, but the pain persisted. After that, my parents took me to our DC who adjusted C6. The pain vanished immediately. When I was 16, I developed a case of shingles. I was ad- justed by Dr. Fred Barge, and the shingles were gone the next day. The next year I got Mono. After 3 adjustments, the Mono was gone. When I was 19 years old, my Father fell off a ladder fracturing C2, 3, & 4. I enrolled in Palmer the next year so that I could find a way to help him. It worked out pretty well because my Father was still water skiing at age 71! KOCH: Dennis, experiences like you had were life changers. When you entered Palmer you knew that chiropractic was about a lot more than bad backs and stiff necks. Tell us how your practice evolved into scoliosis care. WOGGON: I started practice in a town where I didn’t know anyone. My office was 900 sq. ft. I am still in the same building but it has expanded to 9,000 sq. ft. I developed a large family practice seeing 160-180 patients per day. After a while I went into PI work for the challenge of working with severely injured people. Seventeen years ago, a fellow DC brought his 11 year old daughter to me. I remember so well how distressed he was when he showed me her 67 degree Cobb angle. “We have to figure this out,” he said. As you know, Bill, we were told in chiropractic school that we couldn’t correct scoliosis, that all we had to offer them was relief from the associated back and neck pain. I knew that this wasn’t entirely true because my old friend, Dr. Fred Barge, did a lot of work with scoliosis and achieved some degree of success. I knew we could do more. We just had to learn how. I began working with the DC’s daughter. She reduced to a 13 degree Cobb angle after 6 years of research and work. By 2004, we started seeing consistent results and published a case study in BMI, a peer reviewed medical journal. We are now completing a 5 year follow up study on 140 patients. In 2004, I started teaching my scoliosis protocols through Parker College. KOCH: In 2000, you founded Clear institute. I am sure that only you and your wife, Brenda, know the amount of work, long days and sleepless nights that all of this represents. Tell us about it. WOGGON: CLEAR stands for Chiropractic Leadership, Educational Advancement and Research Institute. Our purpose is to find ways to make the DC the definitive SPINAL EXPERT. This evolved into the scoliosis work, but the purpose is not just to make DC’s scoliosis doctors, but to make them better chiropractors. KOCH: That is a very important point. The only way that the chiropractic profession will ascend to its rightful place in the healing arts is for there to be more chiropractors who are truly the experts in spinal care. Scoliosis care is a great place to showcase what we have because it is visible and it has such a dramatic impact on the lives of both the patient and family. Could you please share some of the findings of your research that you would like every DC to know about. WOGGON: Sure, there are a number of things: Scoliosis has a dual cause: the bio-mechanical and the neurological. The biomechanical begins with anterior head translation, the loss of the cervical lordosis, and the lever arms it provides. This causes the body to try to compensate by creating the curves measured by the Cobb angles at the thoracic and lumbar levels. KOCH: That means the Cobb angle is actually a symptom rather than a cause. WOGGON: Exactly, this is the first part of the reason why bracing and the straightening of the spine surgically with Harrington rods is such a failure. These procedures address the symptom not the causes. As long as the causes go uncorrected, the curves will return even to the point of bending Harrington rods and pulling out the screws holding them in place. KOCH: Can you briefly describe the neurological mechanisms that lead to the production of scoliosis? WOGGON: The neurology of scoliosis is very interesting and directly related to the loss of cervical lordosis and the upper cervical subluxation. The loss of lordosis causes a 24% increase of tension on the dura mater. This, in turn, causes 30–40 pounds per sq. inch of pressure on the length of the cord! But that’s not all. The spinocerebellar tracts are subject to pressure applied by the subluxation between the occiput, atlas and axis, as well as the increased cord tension and pressure. Malfunction of the spinocerebellar tracts creates chaos in the control mechanisms of the postural muscles of the spine. KOCH: Dennis, that is great information. No wonder bracing and surgery do not work. WOGGON: The only changes in the medical care of scoliosis that have occurred in the last 50 years have been in the use of titanium Harrington rods in place of stainless steel. The body doesn’t like those either. KOCH: I have observed evidence of birth injury in every scoliosis case I’ve treated. Have you made similar observations? WOGGON: Absolutely. 95% of scoliosis patients have a history of birth trauma. This equates with the dramatic increase of the use of epidurals and C-sections in recent decades. They are perversions of the birthing process and, in most cases, are not necessary. KOCH: You mentioned that you bought a digital video X-ray unit to assist in your research and show in black and white what you saw in your head. Has it shown anything you could not have seen any other way? WOGGON: In the 1½ years that I’ve had video X-ray, I’ve done studies on 430 patients. They have provided an incredible amount of information and insight into the functional mechanics of the spine operating under the force of gravity. One thing it showed that I could not have seen any other way was this: My instrument has a num- ber of frequencies available at my finger tip. While doing video X-ray, I did a series of instrument adjust- ments using several different firing frequencies. They clearly showed that, with my protocol, a frequency of 6 impulses per second was most effective in moving vertebrae, and 12 impulses most effective for disc herniations. Since that finding, I stopped doing manual adjustments on the cervical spine. KOCH: What adjusting instrument are you using now? WOGGON: I am using the Arthrostim™. KOCH: This is all great stuff, and I would love to keep going but space won’t permit it. I would be remiss, however, if I didn’t ask a few more questions that I know our readers would want me to ask. How much time does it take to complete your series of seminars leading to certification by Clear Institute? Also, are CE credits available? WOGGON: The scoliosis certification course consists of 3 parts which add up to about 35 hours of classroom and hands on time. Finally, there is a written test and a practice test. We also offer the option of doing the first and seconnd parts via the internet. CE credits are pro- vided by Parker College. KOCH: Dennis, in closing, please sum up your goals for the future of Clear Institute and vision for Chiropractic. WOGGON: That’s easy; I want to change the world! Through CLEAR Institute, I want to help as many chiropractors as possible become the best chiropractors possible. 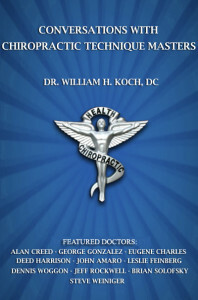 I want chiropractors to be recognized everywhere as the definitive spinal experts. Within the next 10 years, I want young women worldwide to be spared the pain and indignity of medieval braces and the horrors of scoliosis surgery. KOCH: I’ll second that. I think that every chiropractor should, at the very least, be aware of your scoliosis work so that they can refer scoliosis patients to Clear Institute certified DC’s. Those who share our passion to really make a difference and change lives should look into the idea of studying with Clear Institute. WOGGON: Bill, there is something else I would like to add, if I may, regarding a new diagnostic technology for scoliosis that I am really excited about. KOCH: Absolutely, Dennis, please tell us about it. WOGGON: Just this past weekend, on March 6, 2010, CLEAR Institute representatives and I had the opportunity to meet with Axial Biotech in Salt Lake City. This meeting included Dr. Ken Ward, MD, and Dr. James Olgivie, MD. Axial Biotech has developed a saliva genetic test that has a 94% accuracy rate of predicting if a scoliosis patient will get worse. The test is called ScoliScore. They did a trial for the test on a select group of children from 9 to 13 years old with an existing scoliosis of 10 to 25 degrees. I confess I was very skeptical but, after touring their 19 million dollar facility and meeting with them, I was convinced that this is the future of scoliosis diagnosis, and it will pave the way for new scoliosis treatment. They are very interested in working with the chiropractic profession. This would be a win/win relationship. Axial Biotech struck me as an ethical company that puts the needs of the patient first. The patient’s insurance will cover 100% of the genetic testing. If the patient does not have insur- ance, Axial Biotech will provide the test at no cost. I believe that this new information will benefit the entire chiropractic profession. KOCH: That is exciting, Dennis. It sounds like an extremely valuable cutting edge diagnostic technology which we should all know about. It also seems like a great opportunity for more inter-professional cooperation. I hope it helps in the achievement of your goal of revolutionizing scoliosis treatment worldwide within the next decade. Thank you, Dennis, for your service to our profession and humanity, and for sharing your knowledge and vision. I hope that sometime soon we will be able to continue this conversation on one of our beautiful Abaco beaches.